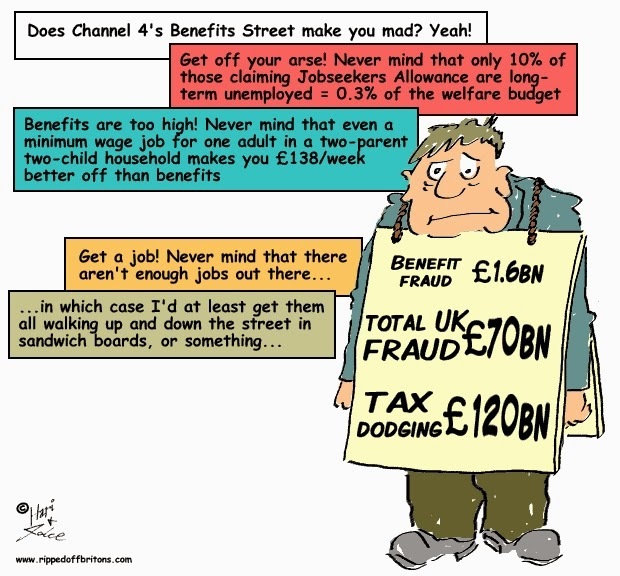 UK government figures for 2012 estimate benefits overpaid due to fraud is £1.2 billion and tax credit fraud is £380 million. So just under £1.6 billion in total; less than 1% of the overall benefits and tax credits expenditure and less than benefits underpaid and overpaid due to error. The UK government estimates that total fraud (public, private and business) across the whole of the economy amounts to £73 billion a year. YouGov poll conducted for the TUC: "Only 21 per cent of people think that this family with two school-age children would be better off if one of the unemployed parents got a 30 hour a week minimum wage job, even though they would actually end up £138 a week better off. Even those who thought they would be better off only thought on average they would gain by £59." UK regional map showing where 1 in 5 adults are in "excessive debt". The vast majority of them are working "strivers"
I don't see any links so sources. I'm assuming that your example is taking account of benefits that the family with a working patent would be entitled (such as child tax credits) to and isn't just taking account if their earnings?